March is the traditional time for graduation ceremonies in Japan. But in 2011 after the devastation of the Tohoku earthquake many ceremonies were cancelled to save electricity. At university graduation ceremonies in Japan men normally wear suits. Women can wear suits but kimono and hakama are traditional. The hakama are not split like a martial arts hakama. The length of the kimono is adjusted by a fold at the waist. Long trailing furisode sleeves are worn by unmarried women. Women normally wear white tabi split-toe socks and formal zori sandals with kimono. 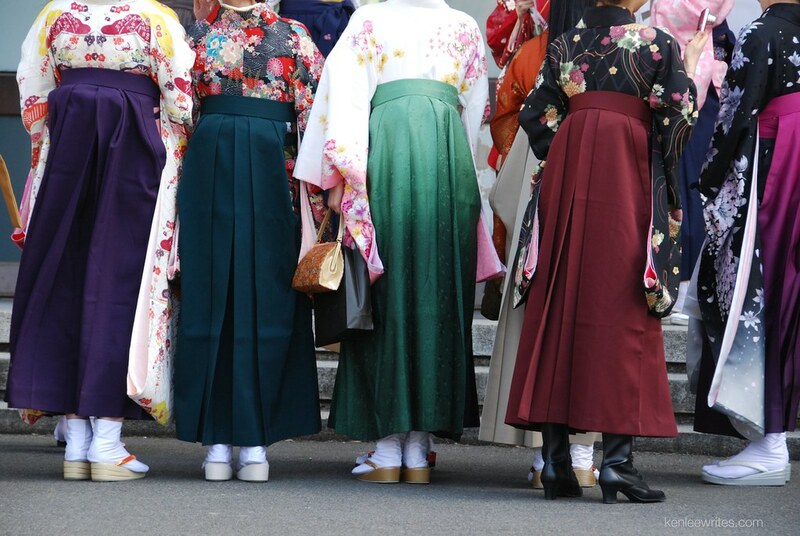 But for a few years many young women have been wearing ankle boots together with hakama. That gives a nostalgic feeling of the Taisho era (1912-1926) and period novels and movies like Botchan or Sorekara by Soseki Natsume. 2011's women graduates will never get to wear hakama. 5 Responses to "hakama gradation/graduation"
Great links Carina. And google translation did a good job for the El Pais article. Thanks. Thanks Niall. I'm sorry for this young people.These are bad memories for them that will make them mature before, but now they'll have the goal to begin with the reconstruction work. And here the last part of a kids-poem of Erina Sakurai written for the Kobe earthquake God has made this earthquake, To remind us we can't take over nature To remind us to look to future Future is the key. Wow, would go well with my California tie dyed Gi's! Hoping for a return towards normalcy for the Japanese people, and for the rest of the world at risk. Maybe the prayers are working.